This is spectacular example of a classic spiny trilobite. It is an impressive Psychopyge elegans from the Atlas Mountains of Morocco. This awesome trilobite was meticulously prepared in the EXTINCTIONS Prep Lab here in Colorado. This type of trilobite has a LONG, pointed snout, long genal spines, long tailspines, and over 30 vertical spines down the back. This specimen displays all of these features beautifully - the snout and tailspines are intact and very well preserved. The occipital ''horn'', genal spines, and the entire array of 30+ back spines have been prepared free-standing - quite impressive! But the truly amazing feature of this specimen is the long, FREE-STANDING snout! Only a master preparator could fully expose this paper-thin proboscis! 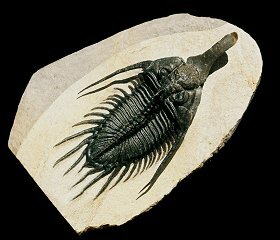 There is absolutely no rock supporting the snout - it is only as thick as the of the shell of the trilobite! This is a top quality Psychopyge that just happens to have its most recognizable feature prepared fully exposed in life position.